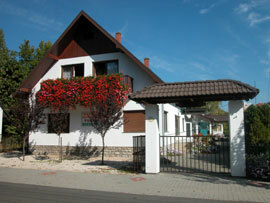 The Napfény Panzio (Sunshine Guesthouse) is situated close to the Balaton lakeside in a quiet residential street. It is close to all the main facilities in Balatonboglár, including the bathing area, the marina, the tennis courts and the shops. Many guests return to the guesthouse year after year, including large numbers of Hungarian, Austrian and German tennis players. The accommodation consists of two apartments and six bedrooms with en suite bathrooms. The Napfény Panzio offers breakfast but guests have to go to nearby restaurants for other meals. The apartments have very simple food preparation facilities while the bedrooms have a fridge for cooling drinks but no cooking facilities. Most rooms have either a terrace or a balcony. There are 6 bedrooms above the breakfast room and bar; four bedrooms with a double bed and a single bed and two bedrooms with just a double bed. All bedrooms have a fridge to store drinks but there are no food preparation facilities. Most bedrooms have a balcony. All bedrooms have a shower, wash basin and WC. There is satellite TV in all bedrooms. Bedding and towels are supplied. The ground floor apartment consists of a large living room with simple food preparation facilities, a bedroom with a double bed and two single beds, a bedroom with a double bed and a single bed and another bedroom with a double bed. There is a bathroom with a bath, shower, washbasin and WC, and there are two smaller shower rooms with wash basin and WC. There is satellite TV in the living room. Bedding and towels are supplied. The first floor apartment consists of a large living room with a small kitchenette, four bedrooms and three WC/bath/shower rooms. The largest bedroom has a double bed and two single beds. The other three bedrooms have a double bed and a single bed. There is a large bathroom with a bath, shower, wash basin and WC, and two smaller shower rooms with shower, wash basin and WC. There is satellite TV in the living room. Bedding and towels are supplied.